This post is the first in a series of summer guest posts here on my site … I hope you enjoy the variety of topics and authors I’ve pulled together for this! This first one is by Marisa McClellan, creator of the popular blog Food in Jars. Marisa is a food writer, canning teacher, and podcaster who lives in Center City Philadelphia. Her latest book is Naturally Sweet Food in Jars: 100 Preserves Made with Coconut, Maple, Honey, and More, all about canning with alternative sugars. She also co-hosts a home cooking podcast called Local Mouthful. I’m delighted to be back again on 100 Days of Real Food. Four years ago, I dropped in to share my recipe for a tiny batch of honey-sweetened blueberry jam. Two years ago, I was here with a batch of honey-sweetened pepper jam (it’s a rustic, naturally sweetened take on the traditional pepper jelly). 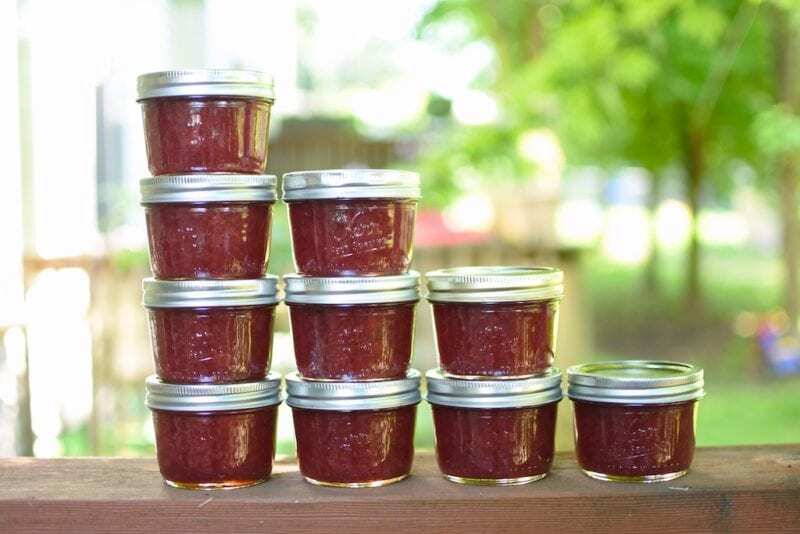 Today, I’m here with a recipe for strawberry jam that’s sweetened with honey and set with Pomona’s Pectin (unlike other commercial pectins, it doesn’t rely on sugar content to create a set). This approach makes a full ten cups of jam and firms up beautifully, thanks to the all-natural thickening power that Pomona’s Pectin brings to the party. This is also a recipe you can use all summer long with other berries. It works beautifully with blueberries, or a combination of your favorite summer fruit. While there’s nothing wrong with making jam without added commercial pectin (and Lisa’s method for using grated apple is a really great one), there are times when one is willing to invest in a box of pectin if it means a shorter cooking time and the guarantee that it will set up firmly. Pomona’s Pectin is a two-part product. When you open the box, you’ll find a small packet of calcium powder and a larger packet of pectin powder (made with dehydrated and finely ground citrus rinds). 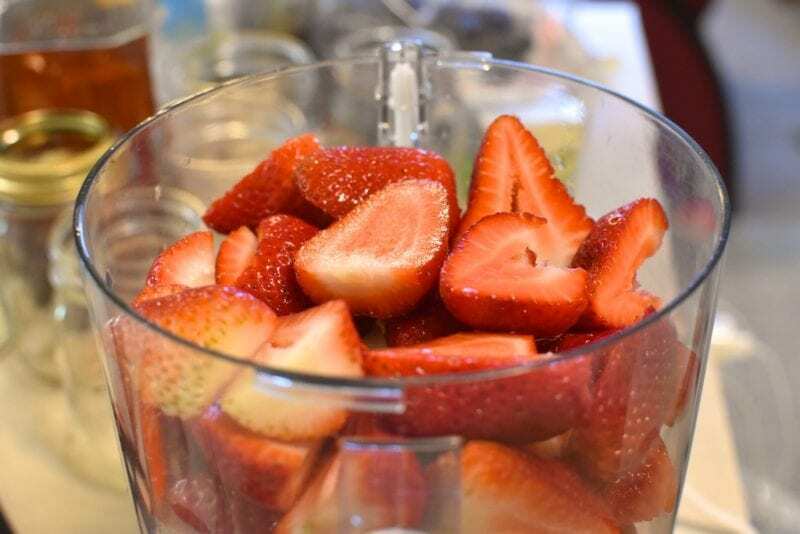 You mix some of the calcium powder with water to create a calcium solution, and combine it with the fruit and some of the sweetener at the beginning of cooking. You reserve some of the sweetener you’re using for the jam and while the fruit cooks down, you stir the pectin into the reserved sweetener. 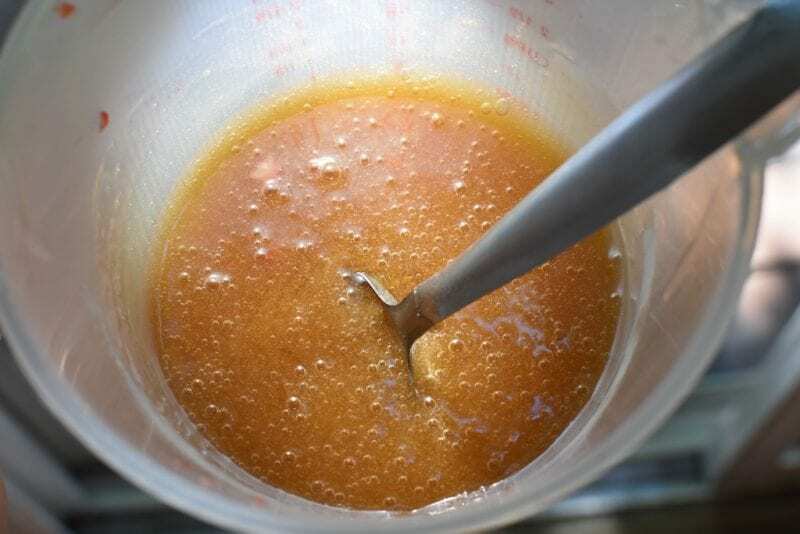 When you first try to stir the pectin powder into a liquid sweetener like honey, it will seem impossible, but as you continue to gently mix, the honey will eventually combine with the pectin quite smoothly. Once you like the consistency of the fruit (for me, this typically takes about 10 to 15 minutes of vigorous cooking), you slowly start adding the pectin-spiked honey. Scoop a little with your spatula or wooden spoon and stir it into the boiling fruit. Repeat that process until all the honey is incorporated. Then it’s simply a matter of boiling for another 5 minutes, until you see visible signs of thickening along the walls of the pot and the drips coming off your spoon. Once the jam is finished cooking, skim the foam off the surface with a big spoon, and then funnel the finished product into hot jars. I like to use half pints because once open, honey-sweetened jams are more prone to getting moldy than sugar sweetened ones. Because of that, it’s a good idea to choose jars that your household can easily eat within a couple of weeks. 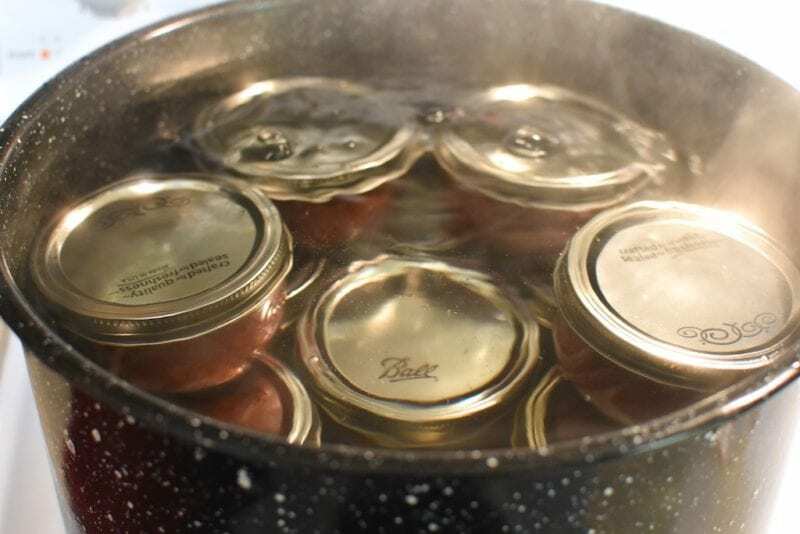 You wipe the rims, apply new, clean lids and rings, and process the jars in a boiling water bath canner for 10 minutes. Once the time is up, you remove the jars from the canner and let them seal on the counter. Once the jars are sealed, you will have a generous amount of firmly set, honey-sweetened jam that you can feel good serving to your family. 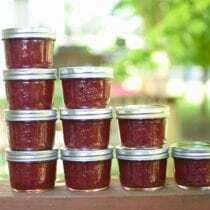 This is a honey-sweetened strawberry jam that gets its firm set from the addition of Pomona's Pectin. 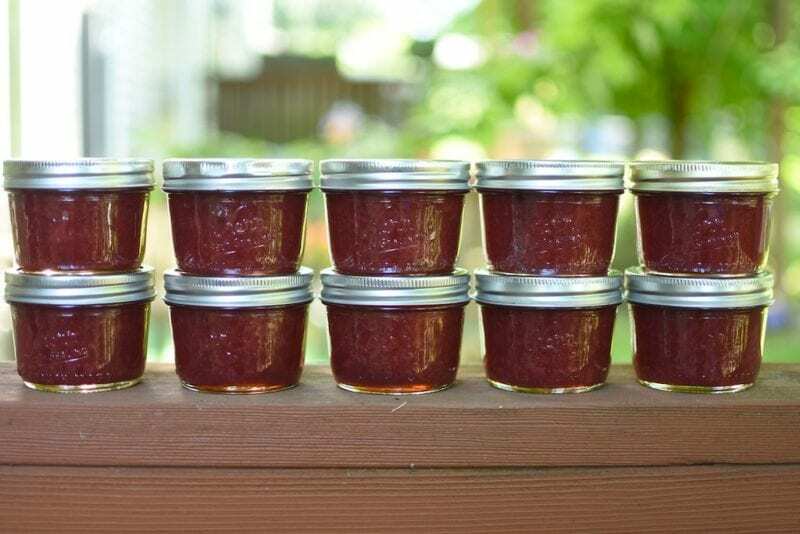 Prepare a canning pot and enough jars, lids, and rims to hold 5 pints of jam. Working in batches, place the berries in the bowl of a food processor fitted with the chopping blade and pulse until well chopped. 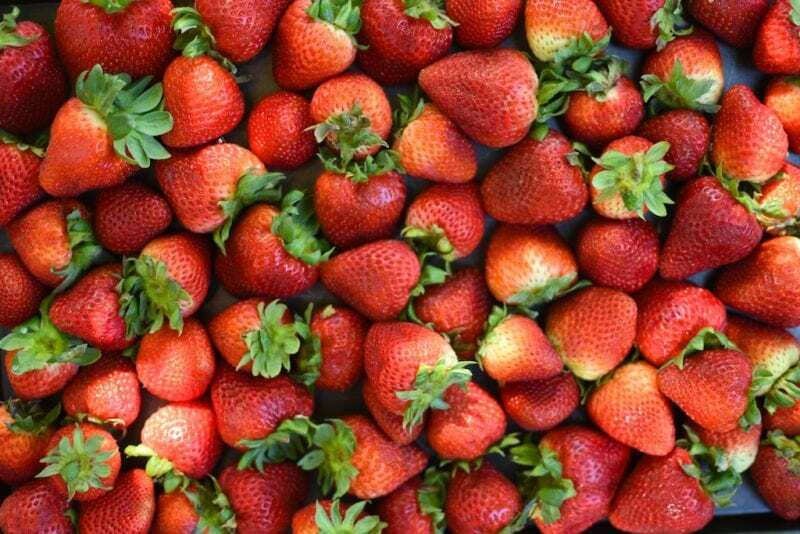 Combine the chopped strawberries, 2 cups of honey, calcium water, lemon zest, and lemon juice in a large pot. Stir until the berries and honey are well-combined. Bring the fruit to a boil over high heat. Reduce the stove to medium-high and cook at a simmer for 10 to 15 minutes. While the berries cook, stir the pectin powder into the remaining honey. When the initial cooking time is up, stir the pectin-spiked honey into the hot jam, one spoonful at a time. 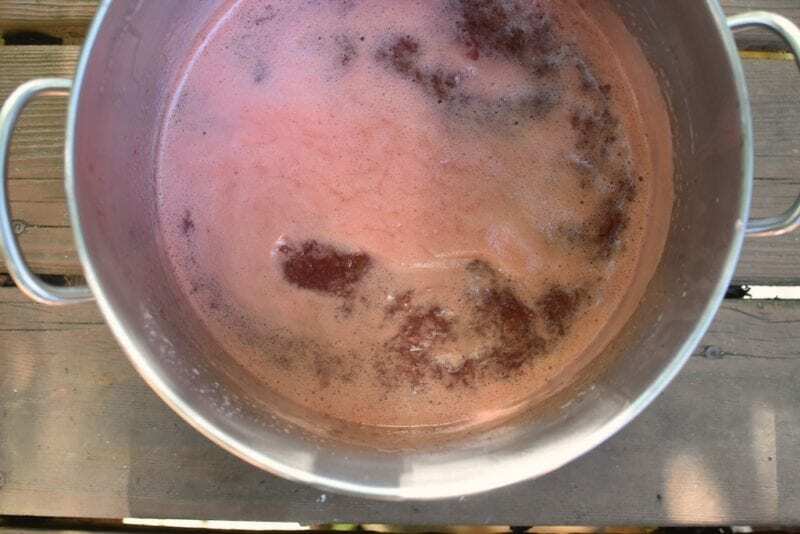 Once all the remaining honey is integrated, return the heat to high, bring the jam back to a rapid boil, and cook for another 3 to 5 minutes, until you see visible signs of thickening. Turn off the heat under the jam and remove the pot from the heat. Skim off any remaining foam. Funnel the jam into the prepared jars. Wipe the rims, apply the lids and rings, and process jars in a boiling water bath for 10 minutes. When time is up, remove jars from canner and let cool on a folded kitchen towel. When jars are cool enough to handle, remove rings and test seals. Any unsealed jars should be refrigerated. All sealed jars are safe for shelf storage. We recommend organic ingredients when feasible. Marisa is the creator of the popular blog Food in Jars. Marisa is a food writer, canning teacher, and dedicated farmers market shopper who lives in Center City Philadelphia. 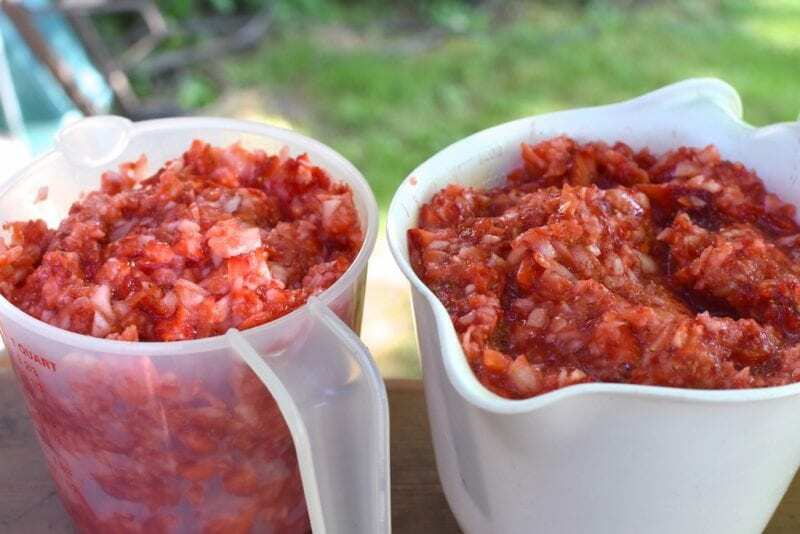 She is the author of Food in Jars: Preserving in Small Batches Year-Round and Preserving by the Pint: Quick Seasonal Canning for Small Spaces. Find more of her jams, pickles, and preserves (all cooked up in her 80-square-foot kitchen) on her website. Honey should never be heated . It loses its nutrients and it becomes toxic once heated according to Ayurveda . There are many Ayurvedic websites providing a detailed explanation on this . So glad to see a wise comment on heating honey. Learning how to prepare “real” food is important. It does not matter how clean or real a food is it you don’t prepare it properly it can cause harm. A cook book called Wise Traditions tells why and how to properly food for max nutrition. 3 cups of honey?! It is still sugar. The recipe Pomana Pectin provides says a half a cup for a batch! I love your recipe,although to me it has alot of sugar. Thanks for the honey sweetened strawberry jam. I Hope as educated food consumers everyone knows that when you cook or bake honey it loses all nutritional value making it no different than white sugar. This “honey sweetened” recipe is not any healthier than if sugar was used. Research unrefined sweeteners that hold up their nutritional value when cooked. 2 cups of honey seems excessive. I don’t see the point of cooking the honey with the other ingredients. I suspect the recipe would work fine if you added the honey at the end of cooking the ingredients. However if the honey has any bacteria in it that processing does not kill you may end up with mold.